Your Hyundai is equipped with sun visors to give the driver and front passenger either frontal or sideward shade. To reduce glare or to shut out direct rays of the sun, turn the sun visor down. A vanity mirror is provided on the back of the sun visor for the driver and front passenger. NOTE: The Supplemental Restraint System (SRS) label containing useful information can be found on the back of each sun visor. WARNING: Do not place the sun visor in such a manner that it obscures visibility of the roadway, traffic or other objects. Opening the lid of the vanity mirror will automatically turn on the mirror light. 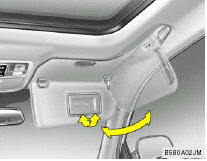 Your vehicle is equipped with sun visor extenders that may be used when the visor is in the side glass position. 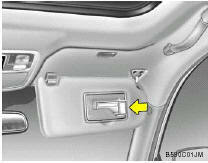 The ticket holder is provided on the front of the sun visor for holding a tollgate ticket.